Posted on Monday, February 25th, 2013 at 2:58pm. In the Park City area, we are blessed with breathtaking views, abundant wildlife, extensive trails and the open spaces to enjoy them on. After living for over thirty years in the Park City area, I’ve learned that there can be a balance between the vital preservation of open space and the needs (or at least the demand) of the many people that want to move into this area. Certainly, there are people that would love to never see another home or condominium under construction again- but almost everyone can agree that open space is a good thing for the area. The Swaner Nature Preserve is a 1200 acre parcel, permanently preserved as open space and located in the area known as the Snyderville Basin. The preserve includes over 850 acres of wetlands, 10 miles of trails, hundreds of species of birds and abundant wildlife. The mostly flat trails are enjoyed in all four seasons for hiking, mountain biking, cross country skiing, snowshoeing. Trails in the Swaner also connect to the hundreds of miles of trails throughout Park City. A few neighborhoods directly border the open space of the Swaner, and someone looking for real estate enhanced by a connection to preserved open space in the Park City area should consider them. Both the Newpark Resort Residences and Foxpointe at Redstone condominiums are located near or directly bordering the preserve. Both projects are also situated in the Kimball Junction area of Park City, providing walking distance access to shopping and dining in an area growing in popularity with locals and visitors. Premium real estate locations within these projects have views of the expansive Swaner in the foreground, ski area views in the distance, and can step from their deck onto the trail system. 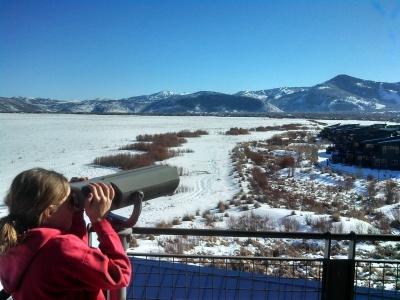 Local Park City Resident enjoying the view from the Swaner Eco Center observation tower. Newpark Townhomes are on the right, Ranch Place can be seen in the distance. Residents of Ranch Place also enjoy close or direct proximity to the preserve. Ranch Place is a very popular community of single family homes within the Silver Springs neighborhood of Park City. Trails from the Swaner seamlessly enter Ranch Place. Homeowners can walk, ski or bike to Kimball Junction or Park City while just crossing one or two quiet streets. Park City and Summit County have preserved thousands of acres of open space. To research real estate located on or near the Swaner or other open space, give us a call. 1 Response to "Real Estate and The Swaner Nature Preserve"
sandra cullen wrote: I am new to this arena, so I had to look up the term Open Space. Posted on Monday, May 13th, 2013 at 4:37am.